Ever wondered why people feel happier when they are close to nature or spend time in nature. Because we are evolved from nature. At the same time, nature always provided for all of man’s desired needs. Living close to nature elevates our positive emotions and moods making us happier and healthier. Maybe, this is one of the reasons why so many people want to live around nature and mountains. Apart from boosting happiness, positive emotion, and kindness, exposure to nature may also have physical and mental health benefits. But wishing to live there doesn’t solve the problem, right. This happiness of people can remain for their lifetime with Pacific Golf Estate in Uttrakhand. 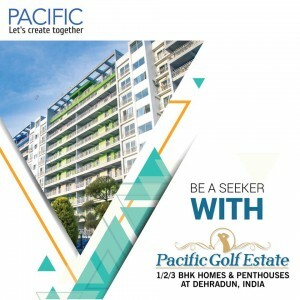 Pacific India brings you the luxurious residential project in Dehradun which is Pacific Golf Estate. They reside in the natural vegetation of Dehradun and are surrounded by green mountain caps. They are offering all types of apartments for sale in Dehradun. The apartments are well designed and crafted with the modern thinking of living spaces. This project is the largest residential project of Dehradun which covers a land of around 35 acres. In Fact, with so much greenery already, 80 percent of the 35 acres of land is dedicated to green vegetation for a green environment. Pacific Golf Estate offers the best independent house in Dehradun at an affordable price. Special spaces are created for all the outdoor sports like Tennis, badminton, basketball court etc. Pacific Golf Estate is the combination of luxury and nature. This is the best living opportunity for people who love nature and luxury. So, enhance your mind, body, and soul by living in nature.